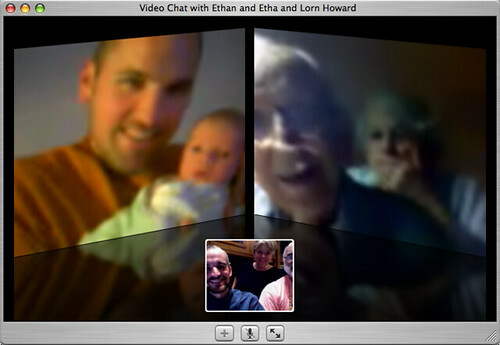 Veritas: Four generations, one video chat. 3-way iChat session, originally uploaded by Michael A. Lowry. Last night, my mom was having a video chat with my brother in Santa Clara, and Ethan was showing off his lovely daughter. Then my grandfather called on the telephone. I suggested that he sign on and we invited him to join the chat. This sort of thing is easy with iChat, an application that comes with every new Mac. What happened next was very special. My grandparents Lorn and Etha in Dallas got their first opportunity to see their great-granddaughter Evelyn via live video from Santa Clara. And of course my mom and dad and I watched the whole thing. Evelyn was alert and active, looking at the screen to follow the faces of her far-away loved ones. We were all impressed by how intelligent she seemed for a two-week-old baby. After a few minutes though, hunger overcame curiosity, and Evelyn began to cry for her mommy. Kelly dutifully plucked her up and fed her mother's milk. To be able to share this experience with far-flung relatives was simply magical. As Ethan pointed out, it was a stroke of genius to add iSight cameras to all new iMacs and Mac laptops. Having the camera built-in (and not having to go through any extra steps to add or configure it) means that any Mac user can have a video chat with any other Mac user. Just grand, I say.